A Stretch Ceiling is a suspended ceiling system consisting of two basic components – a perimeter track and lightweight fabric membrane which stretches and clips into the track. There are hundreds of different colours available in both gloss and matt. Almost any shape can be formed by the track system, although plain rectangles are most popular around a swimming pool. In addition to ceilings the system can be used for wall coverings, light diffusers, floating panels, exhibitions etc. 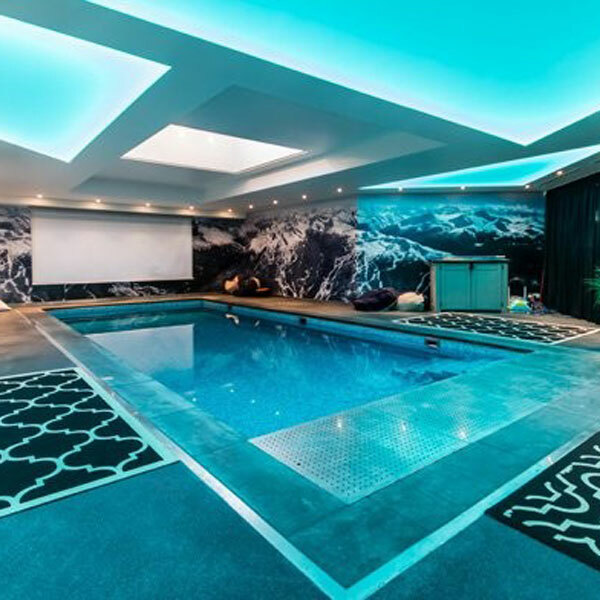 Stretch Ceilings serve two purposes within a pool environment, it acts as a vapor barrier, it is suitable for the humid environment. It will look great for years to come. We also have a system that can be used to distribute the air from your dehumidifier, which means the end of unsighlty grilles on the pool surround. Please ask us for more details. Stretch Ceilings allow the incorporation of all types of lighting, such as the popular starry night effect (fibre optics). Please contact us if you have any questions, require a quotation or advise on any swimming pool service. We are happy to help.